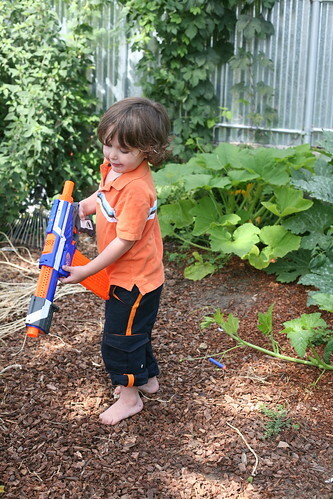 Inder Loves Folk Art: How Nerf guns can help you get your child into mama-mades. 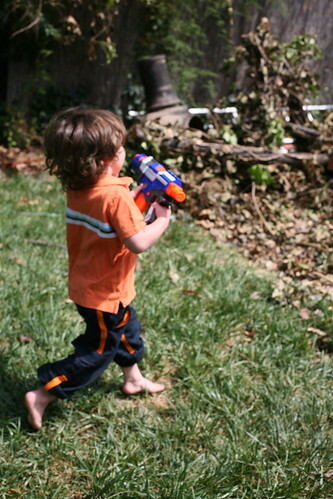 How Nerf guns can help you get your child into mama-mades. I really took a chance on these. I wanted to make Joe some awesome pants. Not soft pants. Something more challenging. 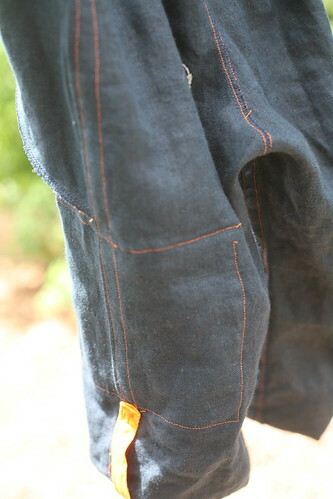 Specifically, Blank Slate's Coastal Cargos. I have been drooling all over this pattern for months! The question of the day was: Will he wear them? I know you're worried. But that's my blog: edge-of-your-seat suspense. I did solicit Joe's thoughts on colors. I was leaning towards bright orange linen with blue accents or natural colored linen with orange accents, but Joe said he would like "dark blue" better. Okay, that would not have been my first choice, but I do happen to have some navy linen, which he specifically approved. I added the bright orange accents. Joe was on the fence about the "o-sange," which is not currently his favorite color (big sigh). But the pants needed something bright and cheerful! As I explained to Steve, if I have to sew a bunch of stuff that looks like something you could buy at Target ... well, ugh, that is just too sad, right? How much design tyranny from a four year old can a seamstress stomach? So I added the orange and hoped for the best! Omigosh. This pattern is fan-freaking-fantastic, people. I had so much fun making these. It's definitely an intermediate pattern, even when you skip the welt pockets and zip fly like I did (I do want to learn how to do welt pockets - one day). But it's like, super awesome. I love the contrast stripe down the side - it is cute and serves a function, enclosing all of the raw seams for a super clean finish. The instructions call for a fully functioning zip fly, but I opted to skip that step and do a faux fly instead. 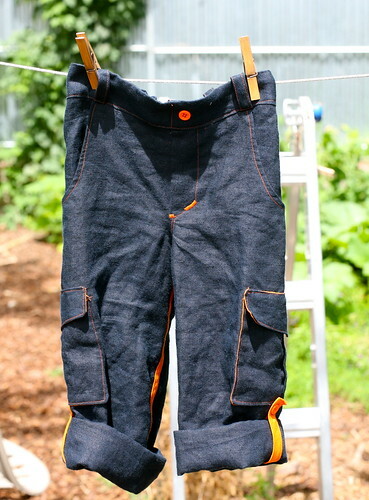 As Joe gets older, I am sure I will want to learn how to do a zip fly, but at this point, most of his RTW pants are pull-on, so I didn't bother. I did do some decorative bar tacks and sew on a button for show. The hardest part of the pattern by far is sewing the bias onto the crotch and inseam. This requires serious scrunching up of fabric. 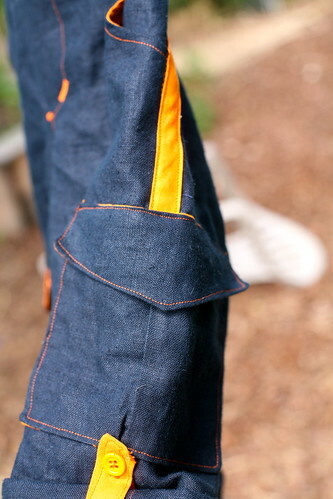 Most of the time, I was working with less than an inch of room as I tried to topstitch the orange down. It was during this part of the operation that Joe knocked me on the elbow and this happened. Ouch! 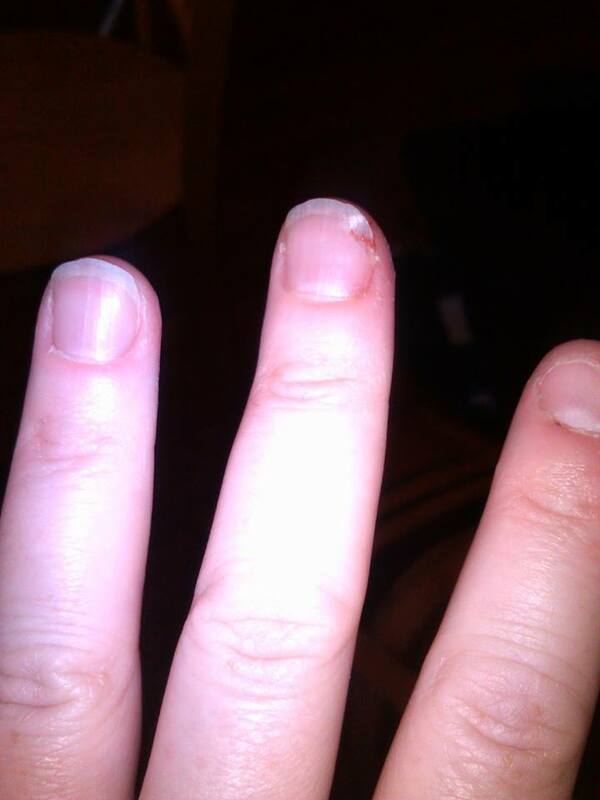 Luckily, it seems that the (size 14) needle broke on my finger nail and did not go all the way through. My nail is broken but otherwise it's not too bad. Sewing with kids around is dangerous! 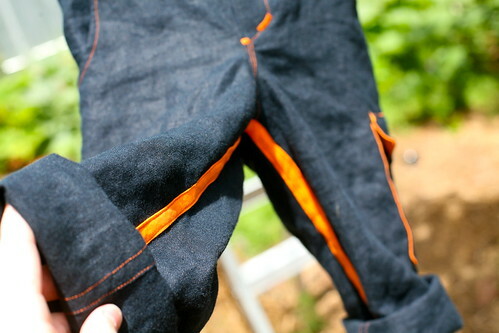 And check out the inside of these pants. Not a raw edge in sight! 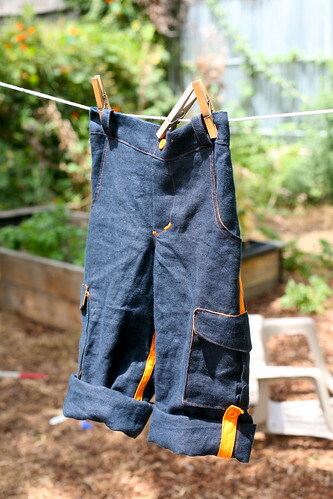 Who says sewing for boys isn't as fun? After a decade hiatus from garment sewing, I got back into it by sewing pants for Joe and I still really, really enjoy sewing for him. Assuming he'll wear what I sew, anyway. And now for the moment you all have been waiting for ... he wore the pants! 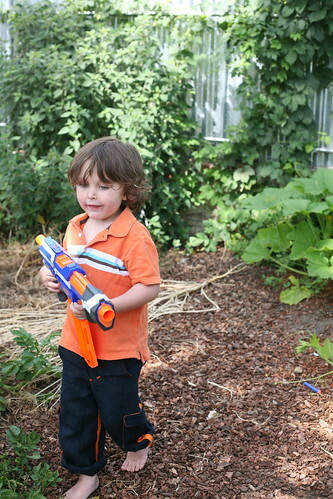 After I put them on him, he began to protest, so I immediately suggested playing with Nerf guns, which is one of Joe's most favorite things to do in the whole universe (thanks Uncle Harpal, for buying my four year old a bunch of semi-automatic foam weaponry rated for ages 8+). So it turns out that the secret to a decent photoshoot with Joe these days is to arm him with a big gun? Hey, his pants match his gun! Within an hour, these pants were covered in dirt, dog hair, and yogurt. "Accepted into the fold," as you might say. Yay! Yay! Clever you - they are fab pants and am so glad he wore them. those are freakin cute. I have this pattern too. joe has great taste. that navy is gorgeous with the orange. 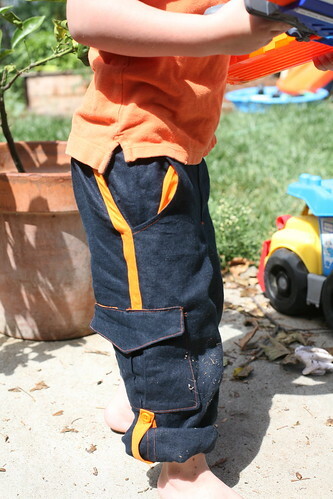 And of course, those cargo pockets are perfect for keeping nerf darts in! ;) The pants are awesome! OW! Poor finger! But, totally worth it for the awesome pants that are being worn, yay!! What cool construction. And yeah, sometimes you just have to give in to the occasional weapon-like toy, sigh.... My brother used to have the most fantastic rubber band gun and he hasn't ever murdered anyone, that I know of. Amazing pants Inder!! I'd been thinking of buying this pattern for my boy, you've definitely convinced me. And I know what you mean about wanting to make something individual. I hope your finger's better soon. Very cute. Love the pants. Always cool to see the inside of the garment too. Love these colors - will be featuring these on Friday!